Even though I am a mother myself, I find it particularly difficult to find unique gifts for my own mother for Mother's Day, for her birthday, and for Christmas. Since I know that she always loves gifts that are beautifully crafted by hand more than mass produced items, I try to keep her in mind whenever I visit Novica.com. Novica offers a wide array of gifts for women, including clothing, handbags, shawls, jewelry, and more that are all handcrafted by artisans from around the globe. When I shop on Novica.com, I usually am looking for something unique to surprise a loved one, but this time I chose two items for myself. Since I have been admiring all the wraparound bracelets I have been seeing for the 2012 Spring/Summer season, I chose this "Brown Trendsetter" Leather Wrap Bracelet made by an artisan named Khanittha in Thailand. 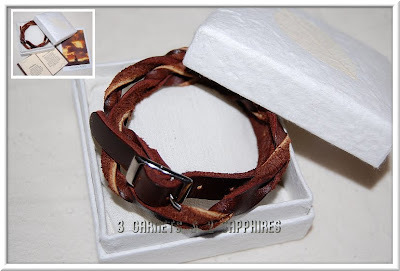 I chose this bracelet for the twisted style of the leather and its deep brown color. Also, this bracelet is adjustable and fits my smaller wrist size very well. Like with most Novica jewelry, this bracelet came in a beautiful gift box. All Novica products are accompanied by a postcard from it's country of origin along with a story about the product and the artisan who created it. At $22.99, this handcrafted leather bracelet is extremely reasonably priced. 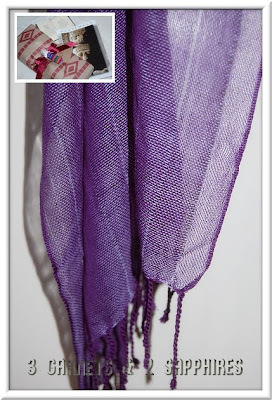 The other product I chose for myself was the "Purple Paths" Cotton Shawl. It looks like this shawl is currently sold out, but there are many more wraps and other women's Central American accessories featured under new arrivals on the website. This particular one was made by the San Jose Women's Artisan Association in Central America. This cotton shawl is the perfect weight for Springtime and cool summer nights. It was also very easy to steam out any wrinkles by just hanging the shawl on a shirt hanger in the bathroom during a hot shower. I have to mention that this product arrived gift wrapped with a charming handmade "worry doll" gift topper with a very interesting story attached to it. 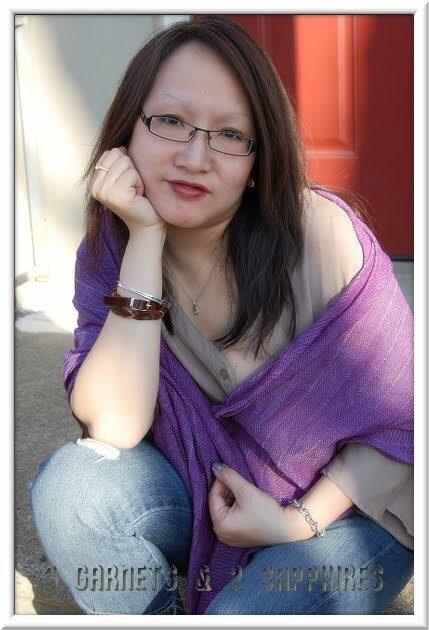 Be sure to checkout all the artisan-made products on Novica.com for Mother's Day, including brightly colored yellow, orange, and green scarves, and for Father's Day, such as men's cufflinks from Indonesia or beautiful chess sets from all over the world. I have ordered Novica products from many different countries and have found that you should allow approximately 3 weeks for the item to arrive. It is best not to wait until the last minute to order your gift since it may have a long way to travel. Thank you to Novica.com for providing a gift code for me to shop for products to base this review upon and for providing an additional gift code for our contest prize.